Lexington County School District Three serves approximately 2,200 students in grade K4 through grade 12. The district has four schools: primary (K4 through grade 2), elementary (grades 3-5), middle (grades 6-8), and a comprehensive high school (grades 9-12). The district also has an alternative school for students in grades 6 through 8 that is housed at the Lifelong Learning Center along with adult education programs. The school district encompasses all of Batesburg-Leesville and the surrounding area. Most of the district is located in Lexington County, but a small portion is also in Saluda County. In 1996 and 1999, the district opened Batesburg-Leesville Elementary and Middle Schools respectively. The district also completed a new 1,000 seat state-of-the-art Fine Arts Center in February 2000. The Fine Arts Center is used by all schools in the district and is also available for rent to civic groups and businesses. The Fine Arts Center is the only one of its kind in Lexington County. 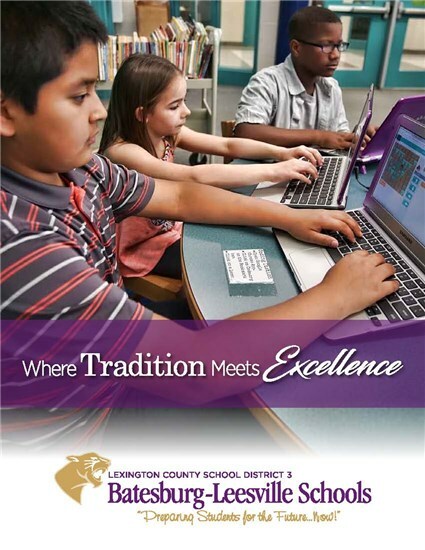 For more information on Lexington School District 3 click here. W. Wyman King Academy opened its doors for the first time in 1972. King Academy is accredited by the South Carolina Independent School Association. SCISA provides many services to the school such as in-service training for teachers and interscholastic academic competitions for various age groups. The accrediting process occurs every three years with on campus visits by an accrediting team and written reports and records of the schools organization and programs. Students from 4 year old kindergarten through 12th grade attend King Academy in a traditional classroom setting. Kindergarten through 5th grade are taught in self-contained classrooms for each grade. The primary emphasis is on reading, writing, math, and language skills along with science, social studies, music, and physical education. Elementary students also have Art, Bible, Computer, PE, Library and Music once a week. Grades 6, 7, and 8 are grouped together in a middle school setting with different teachers in language, reading, math, science, social studies, and physical education. Our high school students have the option of choosing a General Studies diploma or a College Preparatory diploma. To learn more about W. Wyman King Academy click here . Midlands Technical College is a comprehensive, multi-campus, two-year public college serving the primary region of Richland, Lexington and Fairfield counties of South Carolina. College programs and services provide accessible, affordable, quality education that prepares a diverse student population to enter the job market, transfer to senior colleges and universities, and achieve their professional and personal goals. Through its programs and services, the college equitably provides higher education opportunities and strengthens the economic and social vitality of the community. For more information on Midlands Technical College click here . The Batesburg-Leesville Lifelong Learning Center is part of Lexington County School District 3. This campus specializes in Adult Education and First Steps Family Learning and Parenting Center. These areas go hand in hand to promote family literacy, parenting, and education. Classes offered at The Lifelong Learning Center include Basic Education, Pre-GED, GED, English as a Second Language, Certified Nursing Assistant and Paraprofessional/Substitute. For more information on the Lifelong Learning Center click here.